A plague has befallen Cowal. An invasive species which is devastating not only to native plants and trees but also to wild animals and fish, and is damaging the local economy and the human environment. With their dark leaves and bright blooms, it is not hard to see why landowners planted R. ponticum all over their estates. Rhododendron ponticum is a bushy plant that can grow into quite a substantial tree. Its shiny dark green leaves and the abundance of beautiful large flowers that appear on it in the early summer make it in some ways a very attractive plant to have around. Indeed so attractive was it that from the late eighteenth and nineteenth centuries, landowners planted a lot of them. They were seen as an ornament to their estates, and they also provided good cover for gamebirds. R. ponticum spreads prolifically. One mature plant can produce a million seeds a year, and they spread on the wind and grow rapidly. Enormous areas are quickly covered. Its leaves are toxic, so that almost no animals can exploit it, vertebrate or invertebrate. This also means that it cannot be kept in check by being eaten – unlike the native species which it overwhelms. 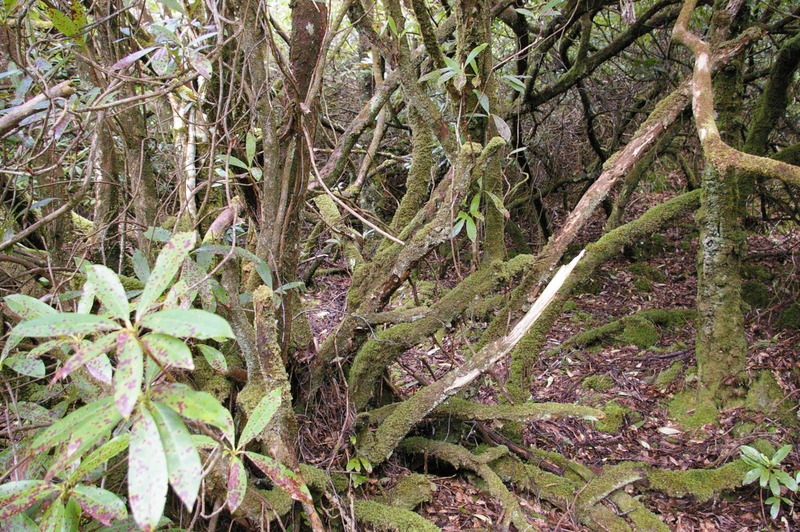 Beneath the canopy of Rhododendron ponticum is a dead floor where nothing else can flourish. R. ponticum allows almost nothing else to grow beneath its branches, creating a uniform wasteland of its own kind. As it wipes out competing plant life, all the animal species which depend on native Scottish plants (trees, bushes, grasses, flowers) also disappear from that zone. Even the beautiful flowers are toxic; honey made by bees from the flowers can make you ill.
Its success as an aggressive colonising plant has allowed it to take over large areas of farmland as well as wilderness, its dense and tangled cover making access virtually impossible. As a result lands that were once farmland have become waste. Farmers have abandoned fields and hill-pasture. Woodland is not only an ecological resource, but an economic one too. And forestry has suffered because R. ponticum has simply overwhelmed native species. R. ponticum is also a major path of transmission for an organism called Phytophthora ramorum, the cause of ‘Sudden Oak Death’, which is a threat to native woodland across Europe. This is a heavy economic blow to an already struggling rural community – the loss of farmland and woodland, the loss of animal life, and the loss of amenities represent the loss of millions of pounds a year to these communities. And this impoverishment only increases the economic pressure on these communities to abandon the land to R. ponticum. The cost of controlling and eventually eradicating R. ponticum from Cowal would be millions of pounds even now, but such is the speed of its expansion that the cost is increasing every year. Such is the threat to Scotland’s environment posed by this plant that vigorous new laws have been passed by our Parliament to stop its spread and to reclaim land from it. 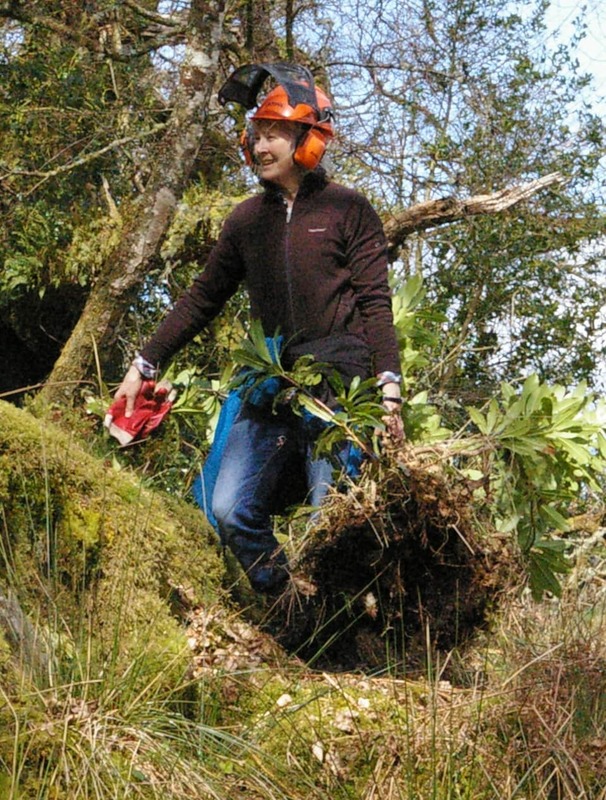 Conservation organisations and landowners are also taking steps to eradicate it, especially from the vulnerable native woodlands such as those of Cowal. 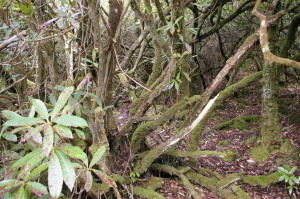 A R. ponticum plant is removed from coastal oak woods. Young plants can be uprooted fairly easily, and fairly liven up a campfire. Watch this space for news of how the eco-pilgrim in Cowal can take part in local efforts to restore habitat and biodiversity. 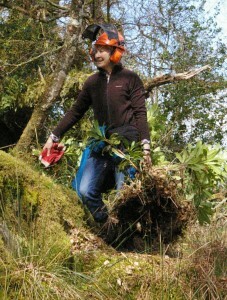 A report from Offwell Woodland & Wildlife Trust. 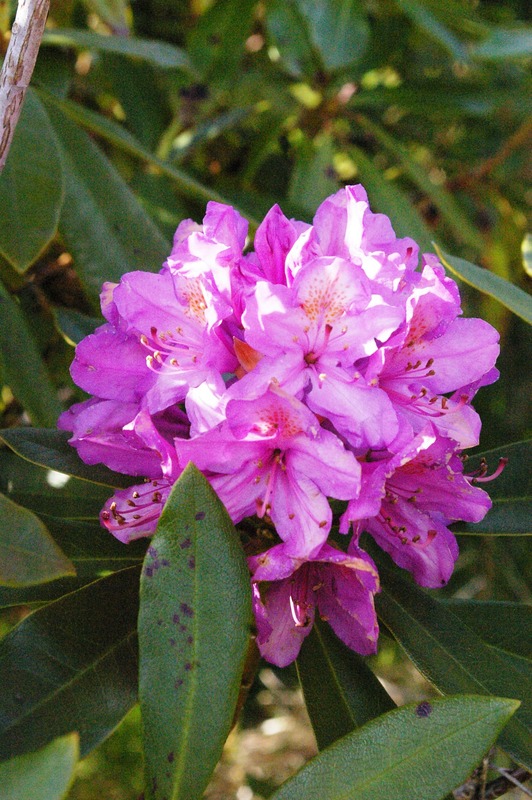 Scottish Government regulations on eradication of invasive species, and grants available. Scottish Government regulations specific to R. Ponticum and its removal. A brief guide to R. Ponticum, and its identification from the Non-Native Species Secretariat. Information from Highland Birchwoods / Coille Beithe na Gàidhealtachd.